The Astro Outlaw by David A. Kelly, a Mysterious Review. Review: Kate Hopkins and her cousin Mike Walsh are in Houston, where Kate's Dad, a talent scout for the Los Angeles Dodgers is meeting his Houston Astro counterpart, when Nicholas Rice, a former astronaut commander, goes missing, together with a priceless moon rock, in The Astro Outlaw, the fourth early chapter mystery in this series by David A. Kelly. Commander Rice is to throw out the ceremonial opening pitch in a game between the Astros and the Colorado Rockies and then sign autographs next to a rock returned from the moon. When he doesn't show up on the pitcher's mound, the game proceeds without him while stadium officials try to find him. Kate and Mike join the search, and find him bound in a closet, his briefcase with the moon rock missing. The cousins later overhear a mysterious conversation between two men, suggesting an illicit transaction will take place "deep in the heart of Texas". They assume that the moon rock will be smuggled out of the stadium and sold to a private collector far from Houston, the chances of recovering it slim. The author cleverly interweaves the player and fan activities of a typical Astro home game, and elements within the stadium itself, with the theft of the moon rock. Better still, a deceptive — but legal — play on the field provides a clue to where Kate and Mike might find the stolen item. It's all great fun, and fans of mysteries and baseball will be delighted with this latest entry in this most entertaining series for young sleuths. Several pages of "Dugout Notes" follow the story that provide fast facts and trivia about the Houston Astros and their stadium. 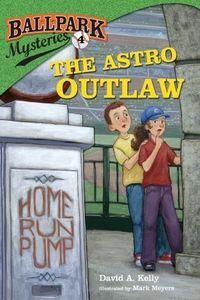 The Astro Outlaw is labeled by the publisher as RL 2.6 (mid-2nd grade reading level). No Lexile measure has been assigned to this book. Acknowledgment: Random House provided a copy of The Astro Outlaw for this review.